Video has become the number one activity on the web. Why not use that to your advantage for your job search? When people see that play button, they are compelled to push in. In just a few seconds of video, someone can learn more about you than reading a three-page résumé. Images and examples of your work can have the same forward momentum. These tools give you a platform to share your videos, images, and work samples. You can import your LinkedIn profile directly into your Innovate CV résumé. This feature saves a lot of time when building your profile. You have more design options that are cleaner and simpler than LinkedIn, yet still very standardized for easy viewing. You can upload video directly into your CV rather than just linking to a YouTube video. Setting up your free online résumé with DoYouBuzz is as simple as importing your LinkedIn profile. You’re given this option when you first sign in. DoYouBuzz gives you many more layout and color options than Innovate CV and presents your résumé more like a web page than as a single document. The home page in your DoYouBuzz résumé includes the main elements of your résumé so the recruiter can have a summary of your profile. Then if he is interested, he can click on each section to get the details and know more about you. DoYouBuzz looks amazing on a mobile device. After setting up your webpage, try visiting it on your phone. The founders of intRvue, the developers of CareerFlair, kept repeating the importance of visual storytelling. They passionately explained how important it is for the candidate to describe successes in a way that engages the hiring manager in a narrative. Their platform was built with this simple premise in mind. CareerFlair’s Story Boards let you tell the stories behind your resume bullets using text, images, and video. Clickable keywords link to resume bullets so viewers can pull up functional views of your accomplishments. Sidebar widgets let you add featured stories, social media chatter, and more. 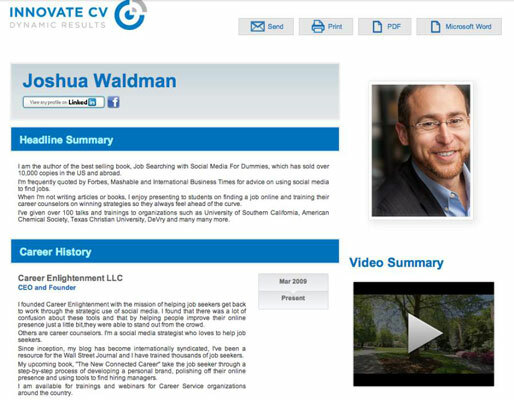 CareerFlair lets you create unlimited versions of your resume and website so you can customize for each job opportunity.